Did Gary Johnson Just Announce For 2016? No, He Did Not. Usually when politicians announce their candidacy, they have things like multiple interviews all lined up, a functional website to unveil, etc. They usually coordinate this with their twitter feed, which Johnson hasn’t updated since Oct 13, and on other social media. Oh, and they usually don’t announce the day before a midterm election when they know the news cycle will completely ignore them. Gary Johnson said no such thing. If you watch the interview, he spends 10 minutes talking about the issues. At the very end of the interview, the host Steve Malzberg started talking about 2016. After Johnson issues the above quotes, you hear Malzberg say “alright folks, you heard it here first” as you can hear Johnson in the background protesting. If that was someone announcing their candidacy for the Presidency, it’s the lamest announcement I’ve ever heard. I’m just going to go out on a limb and say that Newsmax exaggerated this one for clickbait. This was originally posted at my personal blog, JasonPye.com. Stephen Littau asked that I post it at The Liberty Papers. I currently work as Gov. Gary Johnson’s state director in Georgia and blog regularly at United Liberty. Last weekend, I joined several hundred Libertarian Party members at Red Rock Casino and Resort in Las Vegas, Nevada for our national convention. It was a long one, probably a day or two too long, but still a lot of fun both politicking and hanging with friends. The weekend opened without much fanfare. Candidates running for the party’s nomination were seeking “tokens” from delegates in order to appear in the debate and be considered on the floor to represent the LP. Most of the first two days were consumed with the typical wrangling over the party by-laws and platform. There were some internal issues addressed, such as a dispute between two factions in Oregon where the body had to choose what delegation from the state to seat (some of those not seated in Oregon eventually made their way to Georgia, where we had spots open). These first two days were particularly stressful for me since I had to work three delegations to ensure their support for Gov. Gary Johnson. The campaign gave me Idaho and Iowa as my ultimate responsibilities, but I also spent some time lobbying members from Georgia — after all, that’s my home state. When I wasn’t working on delegates, I was either sitting in the pressroom (where there was Internet access) or catching up with old friends. On Friday evening, Gov. Johnson and R. Lee Wrights squared off in a debate before convention delegates (you can watch it here). The 2008 debate saw a number of candidates with varying viewpoints of libertarianism and the direction of the Libertarian Party. The debate between Johnson and Wrights showed the clear differences in approach to politics. While Wrights was lobbing one-liners and soundbites to delegates, Johnson was discussing a more political approach. Some friends were complaining that Wrights was only interested in appealing to Libertarians, others said that, since this was our party’s primary, a more “red meat” approach was necessary; no different from Democratic and Republican campaigns. Most, if not all, of the folks that I talked afterward said that both sides did well articulating their message, and that they hadn’t changed their minds. Saturday was when delegates selected the party’s nominee. Four candidates were able to get enough tokens to be nominated — Gov. Johnson, Wrights, Carl Person, and Jim Burns. Each candidates received some time to make their case for the nomination. We had heard going into the convention that some delegates were resigned to Gov. Johnson winning the nomination, but wanted to give a nod to Wrights on the first ballot. That was the case with a few folks from Georgia, despite my overtures that were would only be one ballot and that they should get, even what they admit, on the winning team. Thanks to a few of the delegates from Oregon and another couple from Nevada being sat with us, Georgia went for Wrights in a 10 to 9 vote. The other delegations that were assigned to me, Idaho and Iowa, broke for Gov. Johnson. And while we may have lost Georgia, Gov. Johnson took the nomination on the first ballot with over 70% of the vote. Wrights received over 25%. Now, one may think that the stress was off and that we were done with the real work, but that wasn’t the case. 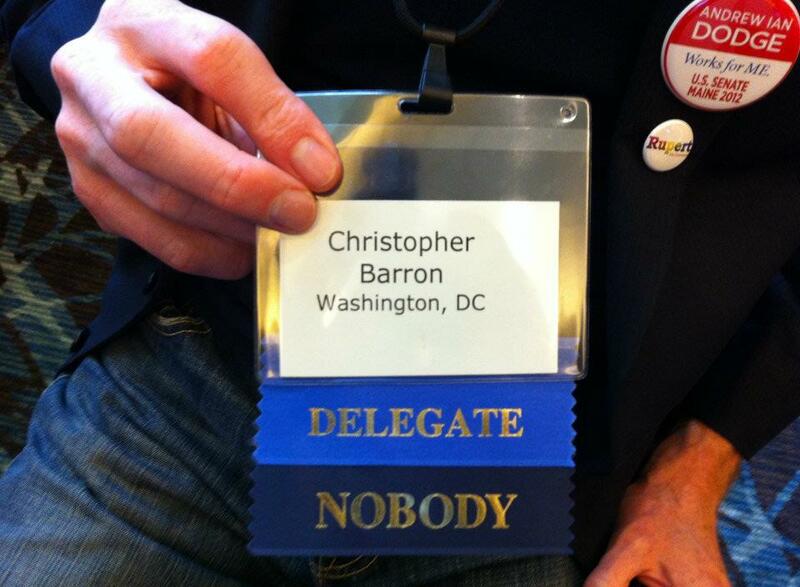 You see, in the Libertarian Party, we run candidates for vice president separately. Gov. Johnson let it be known before the convention that he wanted Judge Jim Gray as his running mate. However, Wrights saw the writing on the wall and was collecting “tokens” for vice president as well (he asked me when I saw him on Wednesday evening). Some of were actually nervous here. Wrights is a great guy, but those of us working on the campaign were tasked with rounding up votes for Judge Gray. But despite a strong showing from Wrights, Judge Gray took the nomination for vice president with 59% of the vote. That’s it, right? Work is done for the weekend. It time to go drink and gamble. Wrong. Chris Barron, Andrew Ian Dodge, Jenny Everett (a new member from Georgia), and I decided that it was time for a drink, so we headed down to Yard House, one of the fine establishments in the Red Rock casino. The body had moved on to officer elections, and after to speaking to my good friend, Brett Bittner, we had contended that Mark Rutherford would likely win the race for chair. We figured we all could just give him our proxies and have some fun. So, off we went. Man, were we wrong. After our second round of drinks, we started hearing that there were some strange things going on. By our fourth round, friends were telling us to get back to the floor. By the time we got back, all hell had broken loose. 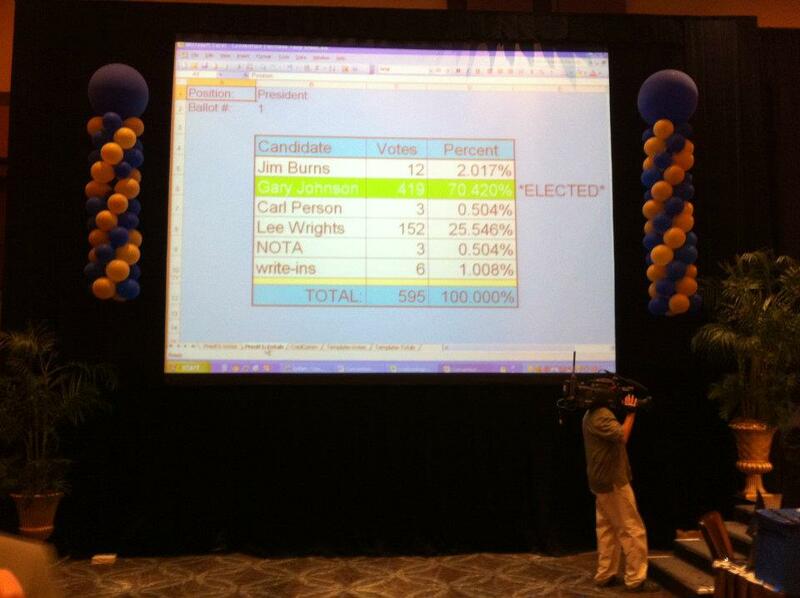 Admittedly, I can’t give the play-by-play, but apparently, None of the Above (NOTA) was a strong candidate. All I can say is that I was incredibly frustrated, probably more than I have been when dealing with party politics or political campaigns. Because of time constraints, voting for chair was postponed until Sunday. The reasoning for floor fight was because of shenanigans pulled before we even got to Vegas, such as charging a floor fee for delegates and having the convention roughly 15 miles away from the strip. Seriously, it cost around $50 to $60 for a cab ride from the airport or the strip. That was ridiculous. Despite staying until the early hours of Sunday morning, I managed to pull myself out of bed for another day of voting. It got…crazy. During the midst of the voting, Chris was arbitrarily removed from the Missouri delegation along with a couple of other folks apparently for voting the “wrong way.” He’d been voting for Rutherford, but there had been some sort of behind the scenes wrangling going on — or at least, that’s the allegation — to ensure that the delegates seated in Missouri that didn’t actually live there (Chris is from DC, but their delegation was full) would no longer have their votes counted. Again, that’s the allegation, there is no way to prove it. But at the very least, it certainly doesn’t sound good. In the end, Geoffrey Neale, a former LNC chair who hadn’t even put his hat in the ring until Sunday, defeated Rutherford and on the fifth round of voting that day, won the race for chair. Lee Wrights, who had lost bids for the presidential and vice presidential nomination the previous day, won the race for vice chair. Wrights is a good guy. I don’t know Neale, but everyone I know seems comfortable with him as chair. He certainly understands that he doesn’t have a mandate. Nevertheless, I have confidence that they will serve our party well. Also, congrats to my good friends, Richard Schrade and Brett Bittner, who were elected to leadership posts. 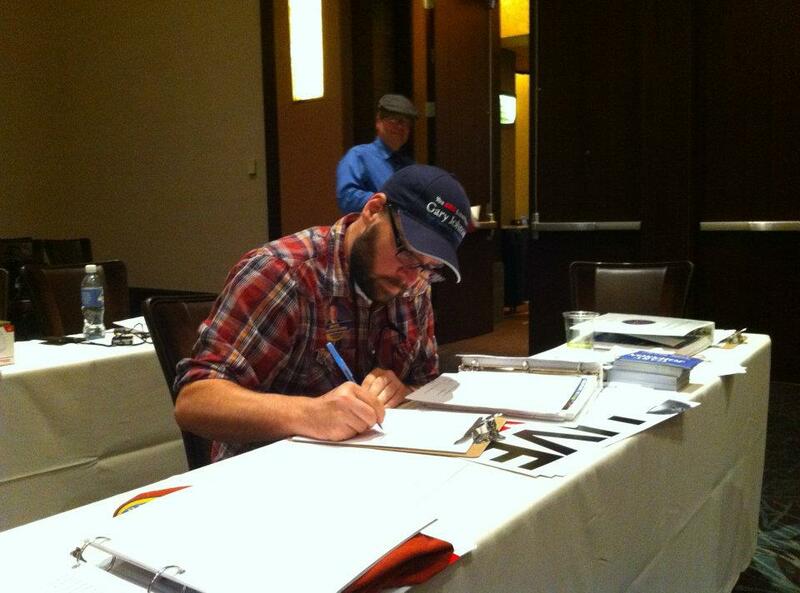 Schrade was elected as the Southeast regional alternate to the Libertarian National Committee. He’ll no doubt serve Georgia’s interests well. 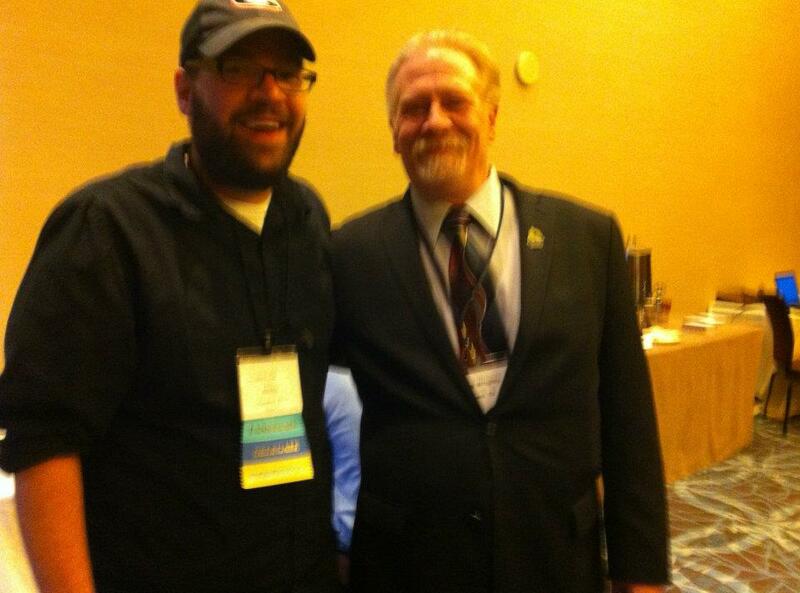 Bittner was elected to the Libertarian State Leadership Alliance (LSLA) at as At-Large Representative. In case you can’t tell from the brief mentions above, the evening parties were pretty neat. I didn’t do much partying at the last two conventions. We did hang out with friends, but I can’t recall doing as much as we did last weekend. Good times where had (RIP #3102) and I got to meet some really cool people, including Rupert Boneham, who you may know from Survivor. He’s running for Governor of Indiana as a Libertarian. I also got to meet Roger Stone, a former GOP operative who recently joined the LP. Roger may never read this, but I learned a lot from him in limited interaction. And let me just say that Chris Barron is a really cool guy. My liver blames him for the amount of adult beverages I consumed in Las Vegas. 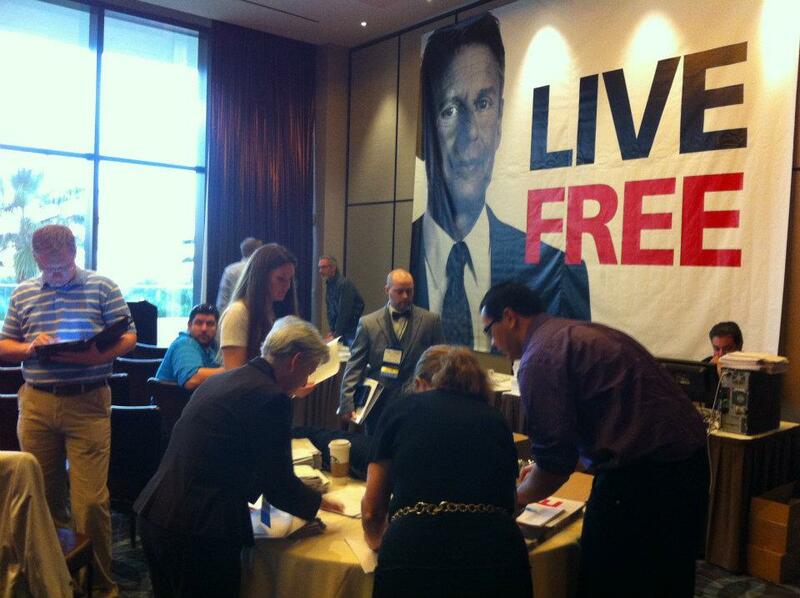 As an aside, I was happy to see so many younger Libertarians at the convention. That was really encouraging. My body has finally recovered from the week of debauchery and stress. I managed to catch up on sleep by Wednesday, though I think it’ll be awhile before I drink again. You can see some pictures from the weekend at my Flickr page. Bruce Majors has also shared his photos from the convention. Aside from the muscular gentleman in the slinky party skirt and halter top, a delegate wearing a Guy Fawkes mask and a prominent speaker sporting a powdered wig, it was a typical political convention. And by the time the Libertarian National Convention concluded in Las Vegas on Saturday, party members had the man they hope can propel them to relevance in presidential politics. Former New Mexico Gov. Gary Johnson won about 70 percent of the vote on more than 600 ballots, finishing well ahead of Libertarian newsletter founder Lee Wrights. What it means is Johnson, a former Republican who served two terms as governor from 1995 to 2003, will carry the party’s torch in a campaign against Democratic incumbent President Barack Obama and presumptive Republican nominee Mitt Romney. Johnson says a “pie-in-the-sky” goal for himself and vice presidential candidate Jim Gray, an Orange County, Calif., Superior Court judge and outspoken critic of the war on drugs, is to generate enough support to qualify for debates on the same stage as Obama and Romney. He’s betting a swell of supporters for Republican presidential candidate Ron Paul will shift to the Libertarian candidates once Romney becomes the nominee. “As much as I would like (Paul) to be the nominee, I don’t think that is going to happen,” Johnson said. Johnson is right about that point, of course. Ron Paul is not going to be the Republican nominee, and even the apparent delegate wins his supporters are racking up at state party conventions in caucus states aren’t going to amount to much of anything in the end. So Paul’s supporters will have a choice, either they support Johnson, they become loyal Republicans and back Romney, or they stay home on Election Day. Johnson is obviously hoping they they choose the first option. 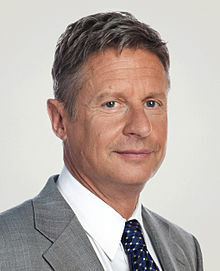 A former governor of New Mexico, he was re-elected by that state’s voters, left office popular after two terms, and therefore has the most executive experience of any Libertarian Party presidential nominee. He can also cite the state he ran as evidence that nothing radical happens when he’s put in charge. An economic conservative and social liberal, he represents a new direction for a party that has long wrestled with its paleo-libertarian wing. And yet he too is certain to lose on Election Day, as third-party candidates in American presidential elections do. The question is whether he can match his party’s 1980 high-water mark and win 1 percent or more of the vote, and whether he might win even more in the key swing state of New Mexico, where voters already know and have cast ballots for him. That would certainly make things interesting wouldn’t it? If Johnson ended up costing the GOP a pick-up in New Mexico, then maybe they’ll stop ignoring the libertarian vote for once. To be realistic, though, the prospects for third-party candidates are never good and they’re unlikely to be much better. Perhaps the greatest role that Johnson can fulfill with this campaign is to become a strong and effective spokesperson for libertarian ideas around the nation, and to stand as proof that you can indeed by an ideological libertarian and govern effectively. That would be no small accomplishment.